OnePlus has announced the successor to its Silver Bullet earphones, launched back in 2014, in the form of OnePlus Bullets (V2) earphones. Although the global availability for the in-ear headphones has been revealed as of now, its pricing in the US is $19.95 (roughly Rs. 1,300), EUR 19.95 (roughly Rs. 1,500) in the EU, or GBP 15.99 (roughly Rs. 1,400) in the United Kingdrom. The earphones will be made available in Black and White (closer to Gold) colour options. 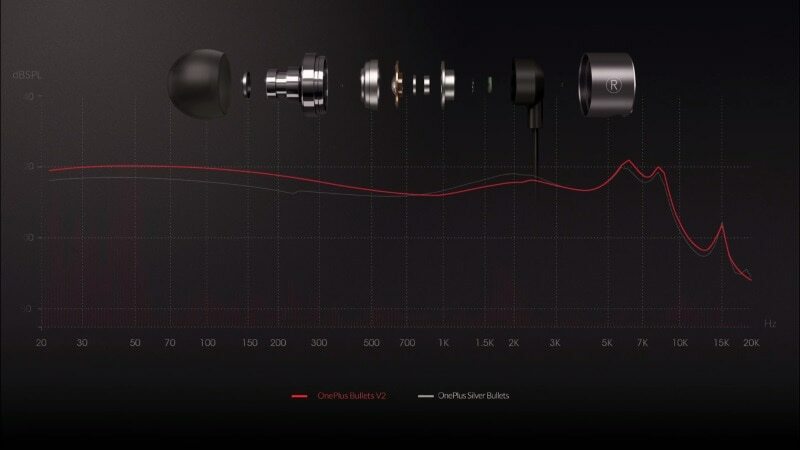 The OnePlus Bullets (V2) in-ear earphones have a frequency range of 20-20000Hz, sound pressure level of 107dB, 9mm dynamic drivers, rated power of 3mW and Total Harmonic Distortion of less than 1 percent (at 1000Hz, 1mW) as per the company’s website. The coil material used is copper-clad aluminium and the earphones come with an Aryphan Polyarylate diaphragm. Bullets (V2) have an impedance of 24 Ohms and come with a 3.5mm headphone jack. The earphones come with a cable length of 1.25 metres, weigh 14 grams, and contain an in-line remote as well. The company has further claimed that the Bullets (V2) earphones are wrapped in high-end Japanese black copper to ensure consistent listening experience. Silicone buds have been carefully shaped to minimise distortion for balanced and clearer sound, it adds.